Hong Kong, 27th March, 2019 – LANDMARK celebrates Hong Kong Art Month with a special ‘dual’ art-installation, as a curation of two separate yet co-existing works are brought together in a stunning display of kinetics and flowing water, resembling the art, colour and movement of nature. LANDMARK ATRIUM’s iconic fountain provides the setting for ‘Nature in Motion’, a joint exhibition, running from 26th March to 14th April, celebrating the imaginative interplay of nature and art. 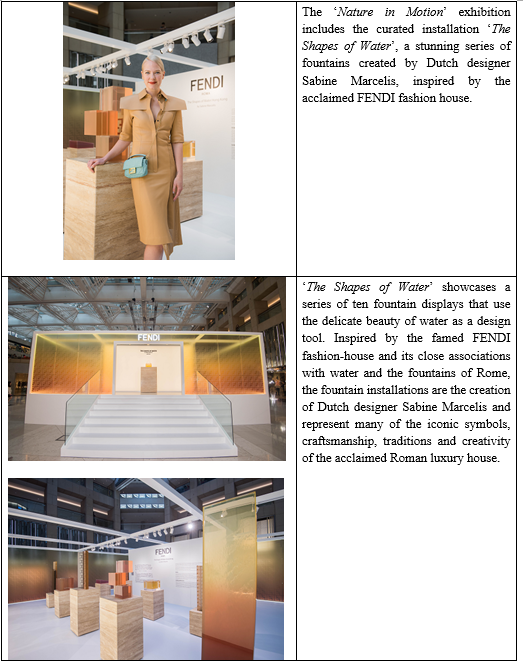 The exhibition includes two specially curated installations; ‘Meadow’, created for LANDMARK by Dutch collective Studio Drift, and ‘The Shapes of Water’, a stunning series of fountains created by Dutch designer Sabine Marcelis, inspired by the acclaimed FENDI fashion house. Suspended from the ceiling of LANDMARK ATRIUM, the artwork ‘Meadow’, the creative work formed by Lonneke Gordijn and Ralph Nauta, creates a constantly moving landscape of light. The kinetic sculpture consists of mechanical flowers that open and close in a poetic choreography, reflecting growth and the impermanence of the ever-changing seasons. ‘The Shapes of Water’ showcases a series of ten fountain displays that use the delicate beauty of water as a design tool. Inspired by the famed FENDI fashion-house and its close associations with water and the fountains of Rome, the fountain installations are the creation of Dutch designer Sabine Marcelis and represent many of the iconic symbols, craftsmanship, traditions and creativity of the acclaimed Roman luxury house. 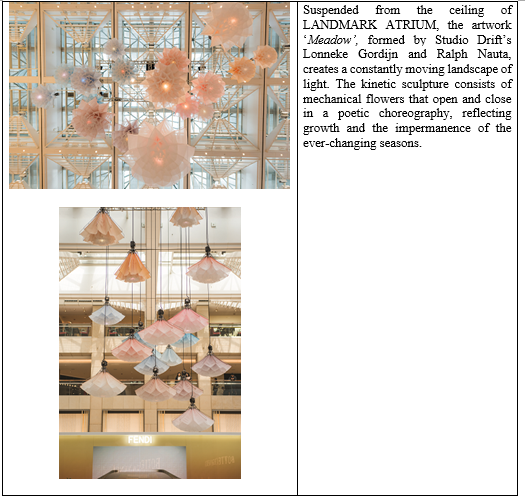 The use of ethereal materials in the two artistic installations, with polished resin and water in contrast to the stone and warm colours reminiscent of the Roman skies adopted by Sabine, compliments perfectly the soft colour palate of the ‘bloom’ lighting of Studio Drift’s ‘Meadow’. 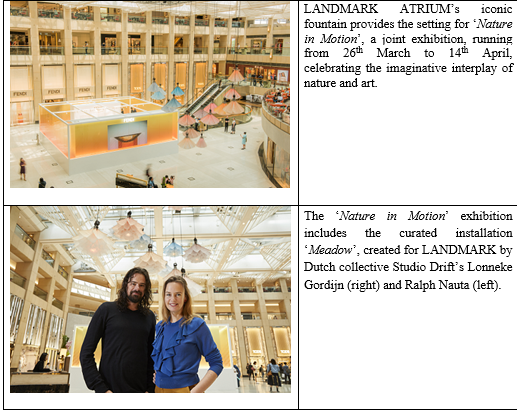 The dual installation ‘Nature in Motion’ creates a harmonious and highly complementary addition to LANDMARK ATRIUM. Style and art intertwine with special campaigns to celebrate the exhibition, including a LANDMARK release of a world-exclusive design of FENDI’s iconic Peekaboo bag, in five stunning colours, created by FENDI creative director Silvia Venturini Fendi. The unique creation is exclusively available at LANDMARK between 26th March and 14th April and can be reserved through LANDMARK Style Concierge. Reserve any items through LANDMARK Style Concierge during the period to receive up to 9,000 BESPOKE points. BESPOKE members purchasing any FENDI items will earn double BESPOKE points. LANDMARK’s F&B artisans are also celebrating the art-initiative, with crafted delicious cocktail and dessert culinary accompaniments to enjoy throughout exhibition period. Mixologists at Dr Fern’s Gin Parlour have concocted the floral-themed ‘Flowers in the Snow’ and ‘The Blossom’ cocktails, accompanied by the ‘Meadow Martini’ created by Dot Cod Seafood Restaurant and Oyster Bar; the ‘Lychee Rose Martini’ by L’Atelier de Joël Robuchon; the ‘Burning History’ whisky-mix cocktail by Zuma, Mak Mak’s The Bare Necessities brings a fresh spring taste in green, which compliments the Superfood Blue Spirulina Latte by The Cakery. Delightful desserts include Strawberry Wild from The Cakery, and Zuma’s Steam Soya Milk Tofu with Wild Strawberries and Sudachi Sorbet in a nod to nature; whilst a delectable collection of three delicious cup-cakes by Sift offer a playful homage to spring. The special dual art-installation celebrates the new ‘A Year of Play’ campaign, which embraces print and digital channels, engaging customers with a comprehensive online presence including a special ‘A Year of Play’ section within the LANDMARK website, https://www.landmark.hk/sc/now-at-landmark/jan2019_a-year-of-play/a-year-of-play; hashtag #AYEAROFPLAY and #LANDMARKHK; together with inspired postings and regular updates on the official Facebook at www.facebook.com/Landmark.hk; Sina Weibo account at www.weibo.com/landmarkhk; and Instagram channel, at www.instagram.com/landmarkhk or search ‘landmarkhk’. Be inspired by ‘A Year of Play’ at LANDMARK. LANDMARK represents the epitome of top-tier luxury shopping and lifestyle experiences. Drawing from a rich heritage which began in 1904 – LANDMARK today is the luxury shopping destination of Hongkong Land’s Central portfolio including 4 iconic connected buildings, LANDMARK ATRIUM, LANDMARK ALEXANDRA, LANDMARK CHATER and LANDMARK PRINCE’S. LANDMARK offers approximately 208 of the finest stores and restaurants, all seamlessly linked by pedestrian bridges. From high fashion and accessories to watches and jewellery, from luxury living to beauty and grooming, from international cuisine to authentic gourmet dining, LANDMARK brings the ultimate shopping experience to the discerning customer. The Group owns and manages more than 850,000 sq. m. of prime office and luxury retail property in key Asian cities, principally in Hong Kong, Singapore, Beijing and Jakarta. Its properties attract the world’s foremost companies and luxury brands. Studio Drift was established in 2007 by Lonneke Gordijn (1980) and Ralph Nauta (1978), who both graduated from the Design Academy Eindhoven (NL) in 2005. In their installations and interactive sculptures the relationship between nature/human/technology is key. Gordijn’s fascination for nature and that of Nauta for science fiction and technology intersect in an intriguing way. Over more than a decade of their existence, Studio Drift’s work in product and furniture design has evolved into increasingly larger, often site-specific and moving installations which they have realized all over the world. The works occupy a wholly unique place between disciplines such as tech art, performance, and biodesign. Data and algorithms derived from natural phenomena often form the basis for Studio Drift’s work – the flight patterns of a flock of birds, for instance. With the help of state-of-the-art technologies they translate this data into poetic, meditative experiences. Their ideas regularly anticipate technological possibilities. The house of FENDI was established by Adele and Edoardo Fendi in Rome in 1925, and was followed by the opening of the first FENDI boutique – a handbag shop and fur workshop. Soon winning international acclaim, FENDI emerged as a brand renowned for its elegance, craftsmanship, innovation and style. The collaboration with Karl Lagerfeld started back in 1965 and has continued since. In 1992 Silvia Venturini Fendi seconds Karl Lagerfeld in the creative direction. In 1994 she is given responsibility of the leather goods accessories and then the direction of the kidswear and menswear lines. In 2000 the LVMH Group acquires FENDI, becoming its majority shareholder in 2001. The Roman luxury house has been a partner of Design Miami/ since 2008. Today FENDI is synonymous with quality, tradition, and creativity. Sabine Marcelis is a Dutch designer who runs her practice from the harbor of Rotterdam. After graduating from the Design Academy of Eindhoven in 2011, Marcelis began working as an independent designer within the fields of product, installation and spacial design with a strong focus on materiality. Her work is characterized by pure forms which highlight material properties. Marcelis applies a strong aesthetic point of view to her collaborations with industry specialists. This method of working allows her to intervene in the manufacturing process, using material research and experimentation to achieve new and surprising visual effects for projects both showcased in galleries and commissioned by commercial clients. Sabine considers her designs to be true sensorial experiences and not simple static works: the experience becomes the function, with a refined and unique aesthetic.